Terra Vista of Oakbrook Terrace Blog Spice it Up! Recently, we discussed how Alzheimer’s disease can affect the 5 senses and we offered some tips for caregivers on how to cope with and manage these symptoms. Perhaps at first glance, losing the sense to taste may seem like the least traumatic or dangerous of the five. However, losing one’s sense of taste can lead to less food intake which in turn, leads to malnutrition and weight loss. From there, the domino effect can lead to countless health issues, ailments and physical impairments. This is why it is so important for caregivers to monitor consumption and do what they can to insure that the person they care for is getting enough nourishment. One way to combat a dulled sense of taste is to increase the flavor of the food and the easiest way to accomplish that is by using spices. Now, we would be remiss if we didn’t mention that a dulled sense of smell will hinder taste as well. It’s similar to having a bad cold…you really can’t taste anything. I recall having a sinus infection a few years ago and going out to eat. I ordered my favorite dishes but was dismayed that I couldn’t taste anything!! I loaded up my dishes with salt and pepper and lots of raw garlic. (It was an Italian restaurant and had chopped garlic on the table.) Anything to boost the flavor so that I could taste something. Needless to say, the experience wasn’t very enjoyable and I ended up taking most of the food home. It was then that I truly understood how important smell is to taste. Cinnamon – Cinnamon has the highest antioxidant value of any spice. It has been shown to reduce inflammation and lower blood sugar and blood triglyceride levels. Cinnamon has also been used to alleviate nausea and to increase sensitivity to insulin and aid in fat burning. It provides manganese, iron and calcium. Its antimicrobial properties can help extend the life of foods. Basil – Basil has anti-inflammatory and antiviral properties and can help prevent osteoarthritis. It has been used in digestive disorders and is being studied for its anti-cancer properties. Though commonly used in Italian cooking, Basil is a versatile herb that can be added to practically anything. Fresh is always best, but dried is okay too as long as it is freshly dried. Arrowroot – Arrowroot is a starchy herb that I like to keep on hand. It has an amazing thickening ability similar to cornstarch, and it can be added to soups, dips, baking etc. It is soothing and highly digestible so it is often used in treatment for conditions like Irritable Bowel Syndrome. Turmeric – Turmeric is a common ingredient in Indian foods, and a great addition to soups. It contains Curcumin, a cancer-fighting compound. It is more often taken medicinally in America for its ability to reduce inflammation and improve joints. Garlic – Most households have garlic around in some form or another. Fresh cloves are always best, but powdered, minced and granulated forms provide excellent flavor. This is another one that goes into everything from eggs, to tuna salad, to baked fish for dinner. Dill Weed/Seed – Dill has antibacterial properties but is most known for its stomach settling ability (ever wonder why pregnant women crave pickles?). It contains a variety of nutrients but loses most when heated to high temperatures. For this reason, it is best used in uncooked recipes or in foods cooked at low temperatures. Cayenne – Cayenne has many health benefits and can improve the absorption of other nutrients in foods. It has been shown to increase circulation and reduce the risk of heart problems. Though available in capsule form, it is also a great addition to many foods. In small amounts, it can be added to practically any dish, meat, vegetable or sauce. Mint – Another wonderful herb that is used in many places of the world, but is not as common here, is mint. It has traditionally been used to calm digestive troubles and alleviate nausea. This herb is easiest to consume in beverage form, though an adventurous cook could add it to meat dishes or dessert recipes. Oregano – Oregano (and it’s milder cousin, Marjoram) are antiviral, antibacterial, anticancer and antibiotic. It is extremely high in antioxidants and has demonstrated antimicrobial properties against food-borne pathogens like Listeria. Cumin – The second most used herb/spice in the world after black pepper, cumin provides a distinct and pleasant taste. Cumin has antimicrobial properties and has been used to reduce flatulence. Rosemary – Rosemary has a high concentration of the antioxidant carnosol and research shows it may have benefits in cancer treatment and healthy digestion and use of cholesterol. Thyme – Thyme is a member of the mint family and contains thymol- a potent antioxidant (and also the potent ingredient in Listerine mouthwash). Curry Powder – It can have a wide variety of ingredients, but often contains turmeric, coriander, cumin, cinnamon, mustard powder, cayenne, ginger, garlic, nutmeg, fenugreek and a wide variety of peppers. With all these ingredients it has an amazing range of beneficial properties. Lavender – Lavender essential oil helps your body produce three of the most powerful antioxidants, glutathione, catalase, and SOD within 22 hours of ingesting. It can also be used to treat nervousness, depression and headache, as well as digestive concerns including flatulence, loss of appetite and nausea. Via inhalation, lavender is popular aromatherapy oil, used to address insomnia, pain and anxiety. This is just a very small list of some of the most common spices and herbs that can be found in local markets. Depending on the area you live in, you might have access to a great deal more. Experiment with flavors when preparing foods for the person you care for. It is common that foods that were once their “favorites” are now disliked…and vice versa. Almost all of these can be incorporated during any meal, including breakfast. Add garlic and herbs to omelettes and scrambled eggs, sprinkle cinnamon or nutmeg on sliced fruit and cereals, etc…these are probably dishes you are serving anyway. The same goes for beverages. 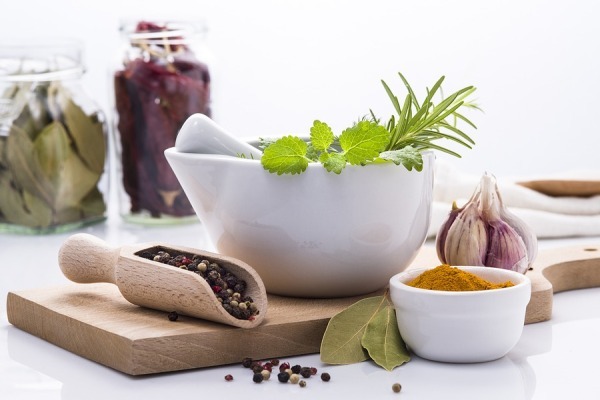 Add herbs and spices to juices, lemonades, teas and even hot chocolate. My grandmother loved warm milk with fresh nutmeg grated on it. Something her mother used to make for her. She found it calming and relaxing. And most importantly, it helped to trigger a memory and a feeling. Taste and smell are both strongly associated with memory recall. Even if it isn’t a specific memory of a place or an event, it stimulates a feeling. Even as adults, most of us still crave tomato soup and grilled cheese sandwiches. We may not be able to recall an exact episode of when we ate it, but it reminds of us childhood and probably a parent or grandparent. The same holds true for people with Alzheimer’s. At the end of my grandmother’s life, she did not recognize any of her family, however, she could always find calm and comfort in her warm milk with nutmeg.